India's second highest civilian honour 'Padma Vibhushan' has been awarded to scientist RA Mashelkar and yoga guru BKS Iyengar for the year 2014. Kamal Haasan, Ruskin Bond, P Gopichand and Leander Paes are few of the Padma Bhushan awardees this year. In total, The Indian President has conferred on the Padma Awards to 127 this year (2014). 10 persons from the category of foreigners, NRIs, PIOs and Posthumous Awardees. 'Padma Vibhushan’, the highest civilian honour after 'Bharat Ratna', is awarded for exceptional and distinguished service. 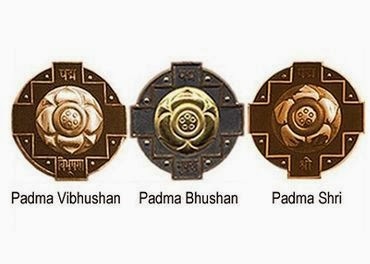 ‘Padma Shri’ is distributed for distinguished service in any field. Though these are actually conferred by the President at Rashtrapati Bhawan sometime around March/ April. All of these awards were established in 1954. The Awards as a whole are given in disciplines/fields of activities like, art, social work, public affairs, science and engineering, trade and industry, medicine, literature and education, sports, civil service, etc. Shri B.K.S. Iyengar Others (Yoga)> "
Dr. Madappa Mahadevappa " "
Dr. Radhakrishnan Koppillil " "
Note: # posthumous* Foreigners / NRIs/ PIOs. Which of the following military decoration is the peacetime equivalent of Param Vir Chakra?